Are you feeling like you need a fresh start with your health? Kickstart your health and weight loss with our Low Carbohydrate Healthy Fat (LCHF) online starter program. Did you know Low Carb Healthy Fat eating has been around for centuries and is not a new concept? We are now seeing more and more people choosing to reverse their modern western diet which is high in processed foods and inflammatory additives, chemicals, and toxins and opt for real food eating. The science supports the health benefits of real food eating for a lifestyle of chronic disease prevention and management and can help you take back control of your health. Want to know more about how LCHF works? 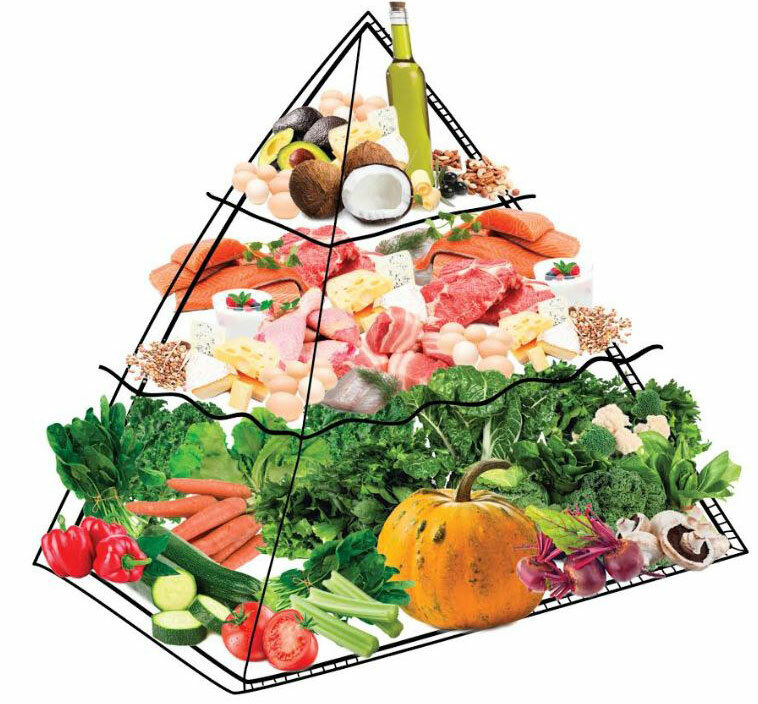 Low Carbohydrate and Healthy Fat (LCHF) is the replacement of carbohydrates in your diet with fresh food, which is lower in carbohydrates and higher in natural fats. This is similar to the well-known keto diet in Australia. If we use a car as a simple analogy, it needs fuel in the tank in order to run. Now, if you think about your own body’s fuel system – it requires a certain amount of fuel each day just to perform basic daily tasks. Imagine your own carbohydrate or sugar tank, this can only hold a maximum of a few hours of fuel at one time (around 2,000 calories of energy). Each time we fill the carbohydrate tank up, our body shifts into gear and is ready to burn this up. But what happens when we overfill the tank? That’s right. It gets stored as fat! Our fat fuel tank is very large in comparison (up to 40,000 calories of energy). It can be stored on the outside and inside of our bodies – causing many life-threatening health risks. However, the human body is very clever. It is designed to also burn fat as a source of fuel! If your carbohydrate tank is left empty for a period of time, then your body will switch over to its other, reserve, fuel tank (the fat tank) and start using fats and protein as its primary fuel source. Therefore, fat burning and weight loss can be achieved, and blood sugar levels can be stabilised, giving you much greater control over your own health. With your body efficiently fuelling on an LCHF lifestyle, you will have more sustained energy, you will experience a reduction in weight (if overweight prior to commencing), and the overall functioning of your body will improve. You will have less pain, less inflammation, improved movement, improved healing… and many more health benefits. At Nutrition for Life Healthcare we really do believe Food is Fuel and that Food is Medicine. When you choose the right foods, you will be choosing improved health, disease management and disease prevention. We have designed this for you to succeed. This is a 30-day program, developed by our team at Nutrition for Life to help you lose weight, and improve your health and energy levels. 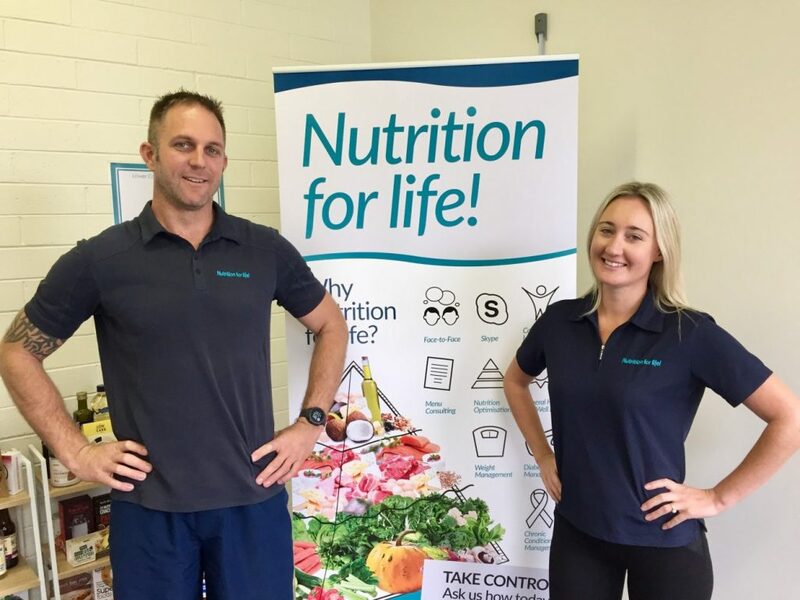 We will teach you the principles of low carb healthy fat eating, share our range of resources to guide you and give you food, meal and recipe ideas. In 30 days you will be able to confidently start healthy low carb eating and achieve key steps to a changed lifestyle. Our program has been designed with your needs in mind. There are 5 steps to success in our program. We have created it in a way that we can educate you and be confident that you will have success. Let us explain a little more. We have been teaching people to lose weight and improve their overall health for over 5 years now. We help clients understand how food is processed by the body and teach what foods are good and not so good. Our method of helping thousands of clients with making food choices has been life changing for them. We know what works and we have all our tools and guidance ready for you in our 30-Day Program. Everything is laid out for you step by step. Our program is very easy to access using a members login on our website. 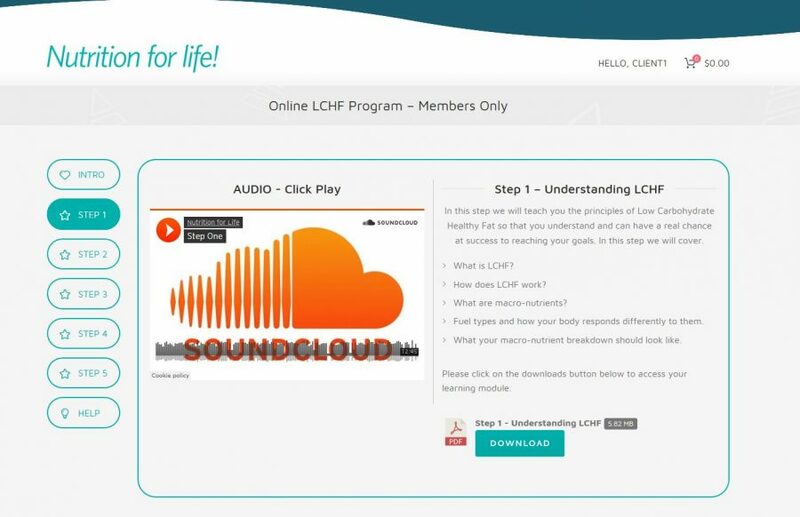 Here you will receive your 5 step learning modules, food lists, recipes and learning audios. This is what your program dashboard looks like. Clean and simple. Plus! Live coaching sessions every week! We want to make sure you succeed every step of the way. Our program Facebook group facilitated by our Health Coach's will offer you guidance and accountability throughout your 30 days. Our Coach's will be live each week, highlighting important parts of each step and answering questions that you have. The group is a fantastic forum for you to see and share your journey with the other program members. Start our program now to access your members area and our private members-only Facebook group. Access to the members area right here on our website. You can login to your program members area here on this website where you will be able to access all of the following amazing program inclusions. Each module has been specifically designed by our qualified team with 1 goal in mind. To help our clients learn and understand the negative impact refined carbohydrates (sugar) plays on our health, how to break this habit cycle and turn it all around. So we have broken this down into steps. We want to keep this as simple but explanatory as possible. Your learning modules are in PDF for you to download and keep. Fuel types and how your body responds differently to them. What your macro-nutrient breakdown should look like. The first five actions to take when transitioning to LCHF. These actions will be your goals! What foods fit into LCHF? How to manage your own portion control. Effects of transitioning to a new style of eating. We have created a range of 10 Low Carb Healthy Fat recipes which are exclusive to this program. All our recipes are Dietitian approved and have easy to follow instructions including nutrition panel. We are regularly creating and updating new recipes. It's time to make a change more than ever! Your health is the most valuable thing in your life. Putting it off until next month or after your holiday is an easy way to let your fears take over. Do something about your health today. Have peace of mind that you now have a plan to lose the weight you have always wanted to shed. Feel the best you have done in years. Take this opportunity right here in front of you now and tell yourself. I'm ready to do this! Our next program launch starts soon. Places for this program are limited. Don't miss out on our next round. To register now and secure your spot, click the Add To Cart button and fill in your details at the checkout, then we can send you everything you need to get ready to go on the start date. We are excited and can't wait to get started! We look forward to seeing you there!